In response to a very inspriring mail-riddle from Mathias Wien and Marc Poppek Böhm creates a crossword puzzle in 1997 with over 100 questions. These partly very specific questions mounted on cards were posted in several stages. The solution was an invitation to Tübingen. 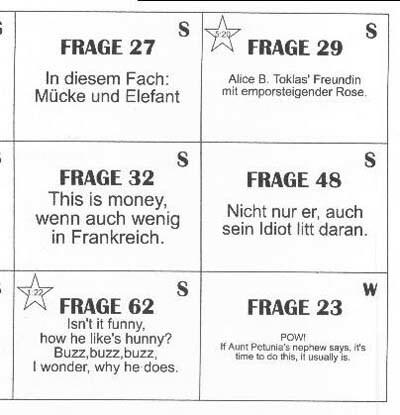 There are three copies of the crossword puzzle, apart from Wien and Poppek, Böhm's parents and Anke Stenzel each received a copy.